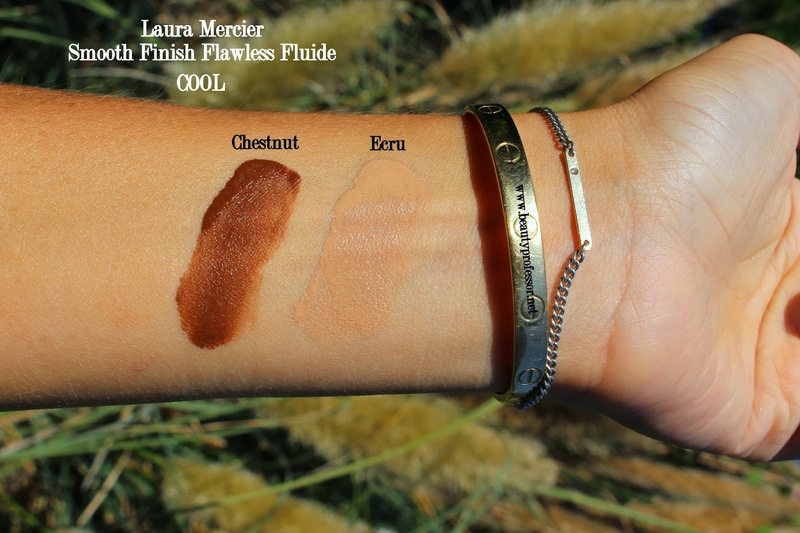 Beauty Professor: Laura Mercier Smooth Finish Flawless Fluide...Swatches, Review and Beauty Look! 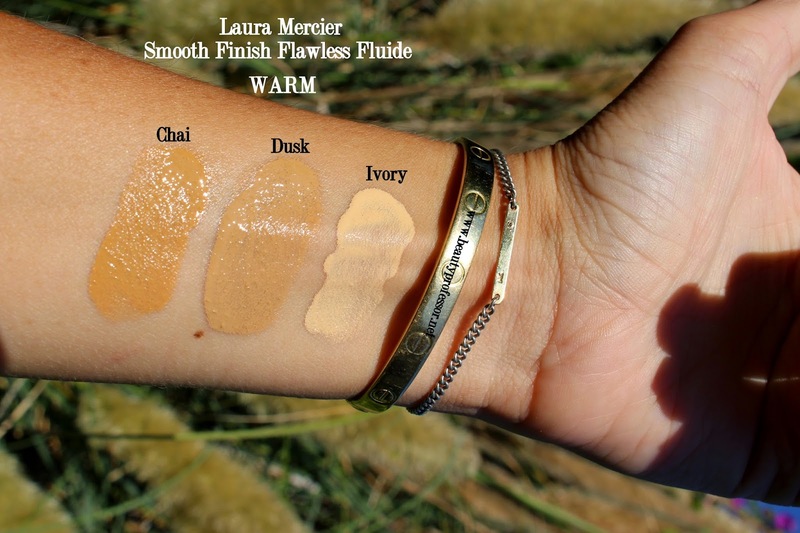 Laura Mercier Smooth Finish Flawless Fluide...Swatches, Review and Beauty Look! Above: An array of Laura Mercier for a flawless face. I have used Laura Mercier products for years. 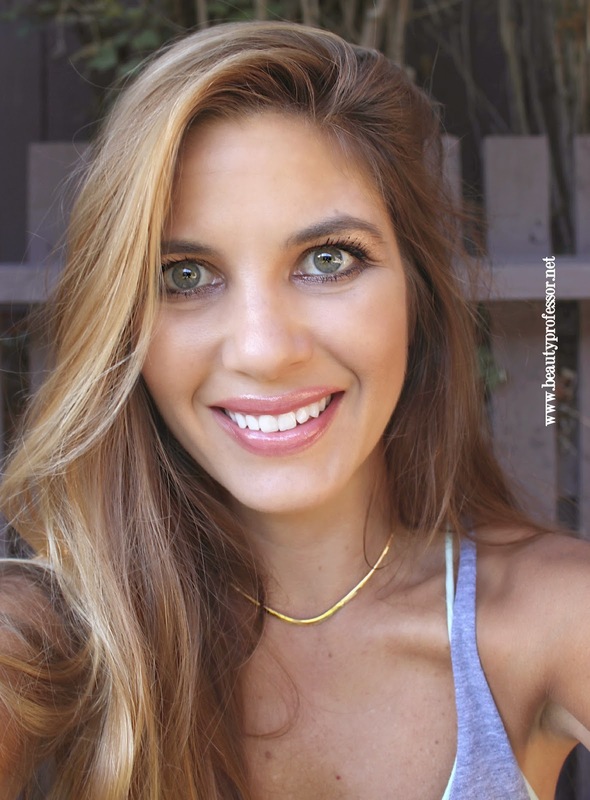 From Secret Camouflage (nothing conceals blemishes better) to her Creme Smooth lipstick in 60's Pink (reviewed HERE), her cosmetics are tasteful, classic and endlessly wearable. Although the color in the Laura Mercier line is gorgeous, the brand is perhaps most synonymous with the concept of the flawless face. With base products ranging from sheer tinted moisturizer to finely-milled mineral powder (and everything in-between), the flawless face now has a new Laura Mercier option...the Smooth Finish Flawless Fluide, a revolutionary oil-free formula that feels extraordinarily light while still providing magnificent coverage. Above: Laura Mercier flawless face options, including award-winning primer and tinted moisturizer. Initially, I was able to visit with Laura Mercier Specialist, Erika Poblano, who candidly shared the flawless face philosophy with me. I couldn't wait to swatch the freshly-released Smooth Finish Flawless Fluide, which comes in an impressive spectrum of 24 shades! Above: Laura Mercier Makeup Artist Erika Poblano and Beauty Professor. The Smooth Finish Flawless Fluide is brilliant. The liquid formula feels like water and glides on the skin effortlessly, leaving an incredibly natural veil of buildable, medium to full coverage in its wake. I find that only a few drops are necessary to cover my entire face and, should more coverage be necessary, another drop or two can be buffed on without looking the slightest bit cakey. This formula has a satin matte finish that doesn't oxidize; it is friendly to sensitive skin (like mine!) and has particularly significant lasting power. Although it feels quite "thin" and liquid in texture, once it sets (in approximately 30 seconds or so), it doesn't slide, budge, pool or transfer...marvelous! Above: The ingredients for MY flawless face...Laura Mercier Radiance Foundation Primer + Smooth Finish Flawless Fluide in Dusk. A long-wear, oil-free foundation that magically blurs the line between real skin and makeup. Shake & tap to activate! PRODUCT TECHNOLOGY: This revolutionary bi-phase, two part formula is designed to deliver the most natural looking colour and lightweight coverage. Colour true pigments rest at the bottom of the package while reflective waters (Hydro-Brilliant Technology) float to the top. Vigorously shaking the package before each use ensures the pigments blend with the reflective waters to create fresh colour every time. APPLICATION TECHNIQUE: SHAKE & TAP TO ACTIVATE! To activate: with each use shake vigorously for a minimum of 10 seconds andtap several times at the end of the package by the shade label. To apply: dispense onto back of your hand and apply to clean skin with Laura’s Foundation Sponge or fingertips. For best results, use with your preferred Laura Mercier Foundation Primer. WHAT TO EXPECT: Once you shake and tap to activate the formula, gently release the cap. You may experience a surge of product when dispensed. This is normal for a bi-phased formula. If the formula appears separated, it has not been shaken long enough. Just put the cap back on and shake more vigorously. I was able to swatch 11 shades of the Smooth Finish Flawless Fluide--representative of neutral, warm and cool undertones--in the 24 color spectrum and am thrilled to present them to you in various lighting situations. 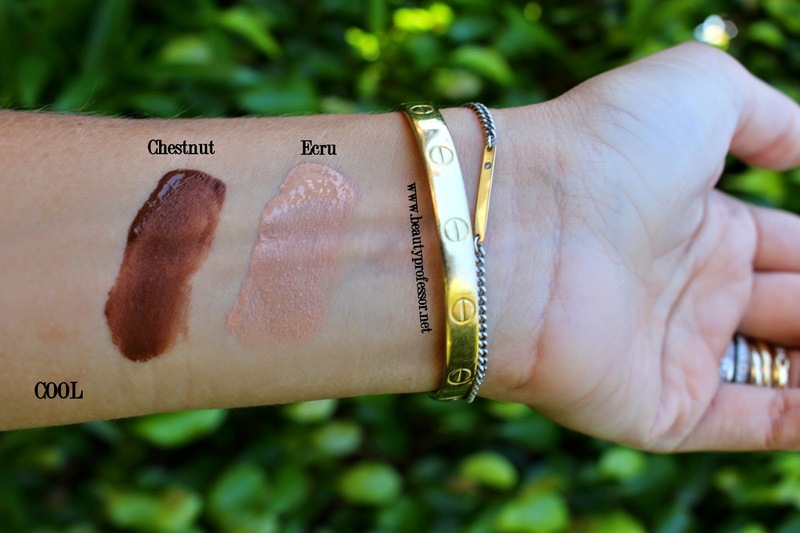 Above: Swatches of the neutral shades in direct sunlight. 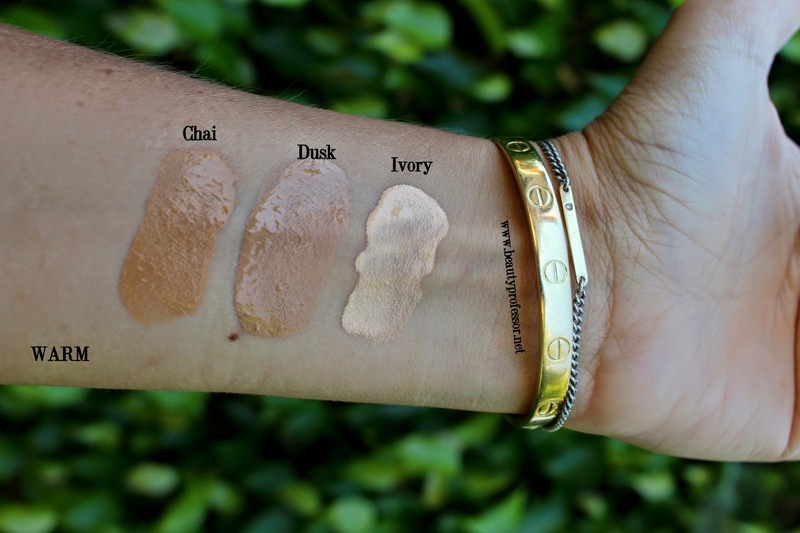 Above: Swatches of the neutral shades in outdoor shade. 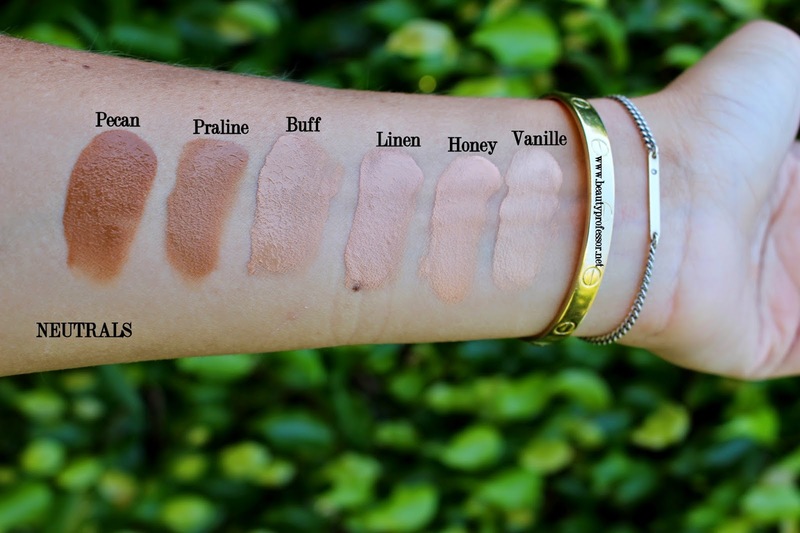 Above: Swatches of select warm shades in direct sunlight. Dusk: Medium beige for medium skin with warm undertones (@NC 27) **My current match! Above: Swatches of select warm shades in outdoor shade. Above: Swatches of select cool shades in direct sunlight. Above: Swatches of select cool shades in outdoor shade. Above: Products for my Laura Mercier beauty look. Above: A closeup of the Creme Smooth Lip Color in Coral Creme...stunning, no? 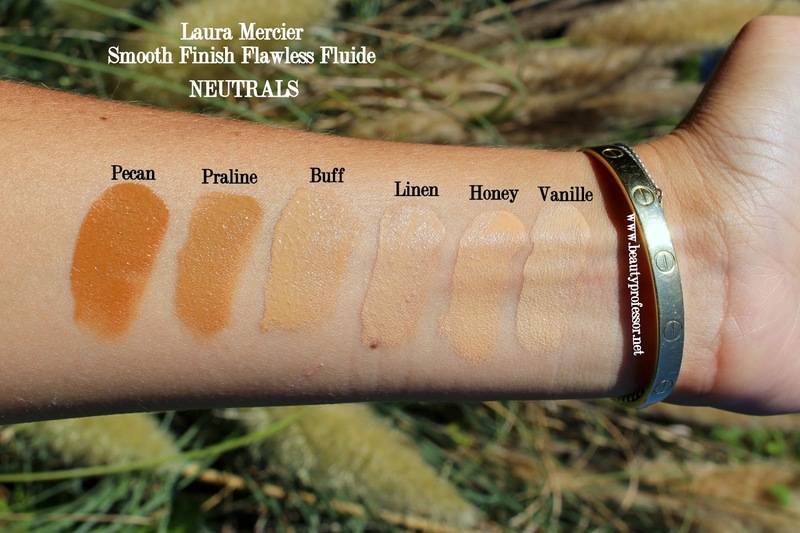 Above: Swatches of all Laura Mercier products used to create the beauty look...this image was taken in direct sunlight. Above: Creme Coral + Bare Baby. 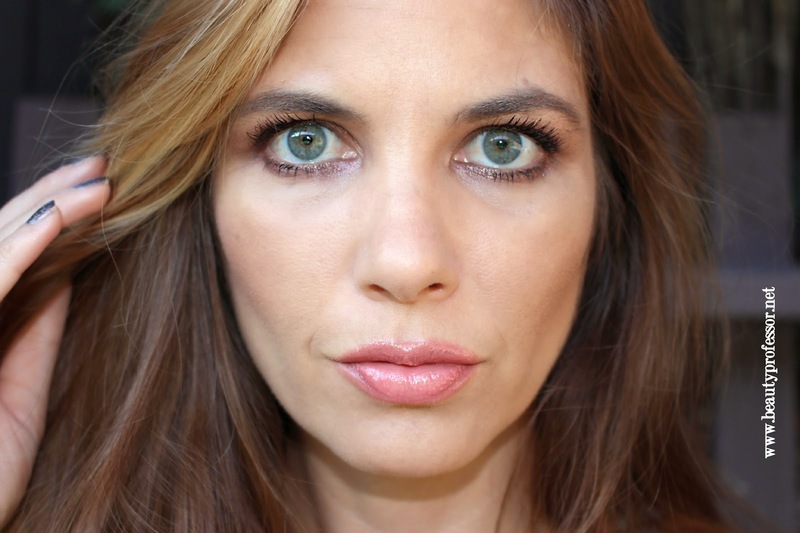 Above: A Laura Mercier flawless face from dawn 'till dusk. Bottom Line: The Laura Mercier line is classically beautiful; from its vibrant color collection to one of the most comprehensive spectrum of base options ever to be housed within a single brand, the flawless face is achievable for every woman. I am duly impressed by the texture, finish, performance and wear of the Smooth Finish Flawless Fluide and would love to hear your thoughts on this formidable formula! **Post sponsored by Laura Mercier, however, as always, all of my opinions are expressly and unequivocally my own. Hi Rachel! How would you say the longevity of the Laura Mercier Smooth Finish compares with the new Tom Ford Traceless Perfecting Cream foundation? I find that the longevity is quite significant (easily over 8 hours without budging), but I haven't had anything last as long as the TF formula. Hello, which foundation would prefer, the Tom ford perfecting foundation or the Laura Mercier? And can you tell me the difference between the two? Texture wise and the yellow undertone. Thanks for the question! That is a tough call...the Tom Ford is incredible for long, hot days and medium to full coverage while the Laura Mercier is better for normal climates and medium coverage. Texture wise, the Tom Ford is much thicker in consistency than the Laura Mercier which is quite fluid...also, both have shades with yellow undertones! I think tht Dusk is more yellow than Chai but Chai is deeper in tone! I need your help with colour selection for this foundation. I can't decide between dusk and buff. Dusk seems so dark in the swatches but on your skin looks a perfect match, I am nearly the same colour as you in your photos and will be a match as it gets into the summer more so your help would be so appreciated. How did this foundation hold up on its claim of being sweat and humidity proof? It's starting to get very hot here and I need something long lasting, in my dreams it would be the Tom Ford traceless perfecting foundation, maybe one day. Sorry for the lack of communication of late but I have been unbelievably busy as we are in the midst of selling our house and relocating to Perth as my husband is starting his own business. Very scary and exciting at the same time. I have been still faithfully reading and loving your blog it is refreshing to be able to read through and help take my mind of everything that is going on. I hope that all is well with you and your family and I look forward to seeing what you think for colour choice. So wonderful to hear from you! I am excited about your family's new business and your big move...so many changes and I wish you the best with all of them! Thanks for being such a faithful reader and friend. With regards to your question, that is tough...Dusk is definitely a good match for my post summer skin (at its tannest) but would be too dark for me now. Buff is just a tiny step in the slightly lighter direction, but if you end up getting darker, then you warm it up with a bit more bronzer. I am just hesitant to suggest a shade that is too dark, so, in my conservative opinion, I would suggest Buff. This formula makes the skin look so smooth, offers lovely coverage and does hold up (even in humidity) for hours on end. I suspect you'll love it! i love LM flawless in linen, do u think its a match with Tom Ford traceless in natural beige or fawn? Hi Cam...Linen is closest to Ivory (on the light side) and Natural Beige (on the darker side) in the TF formula! Hi Rachel, I also own LM's secret camouflage. However, I can't seem to make it work due to its texture. How do you usually use it? Thanks! I generally mix the two shades with a little concealer brush and buff the tiniest amount over a spot or blemish. I think it is probably too dry for the under eye region (unless mixed with moisturizer) but it is incredible to cover a dark spot! I am late to this party as well, but is the shade ivory lighter or darker than Nars Siberia in your opinion?